Though the sidestep from the main crux of this immense sage featuring the Daleks, the Eminence, and the Master after so many tightly interlinked stories was an odd but satisfying note to begin this final box set on, it absolutely allowed Liv as well as the relationship between the Doctor and Liv to develop much more than the constant backdrop of impending doom and grand machinations ever could have. Through the quieter moments in particular, Liv truly became a more well-rounded character as she was allowed to step away from her constant sense of grim determination and melancholy, and here Nicola Walker excels as Liv comfortably takes the lead with her own exploration through Paris apart from the Doctor that highlights just how strong and capable she truly is. At the same time, in an incarnation perfectly suited for the timelessly romantic nature of Paris, the Doctor is able to avoid the seduction and distractions of the city that have claimed so many as all roads lead to Adelaine Dutemps and the mysterious secret deep within the Red Pagoda that so dominates the skyline. With nods to Moulin Rouge with its setup, ‘The Monster of Montmartre’ perfectly captures the sounds and spirit of Paris, and the eventual reveal of the Dalek Time Controller bursting forth from the stage in all its anachronistic glory is all the stronger for it. Indeed, the beings ravaging the streets being failed Dalek experiments and Adelaine herself being a Dalek clone wonderfully gives everything a far greater context, and the fact that the Time Controller is exploiting the greatest criminal minds of this era to craft a fleet of time strategists to grant him control of Dalek operations throughout all of time and space similarly creates an exciting dynamic given that the Daleks in general do not consider this being to be part of their timeline. Providing a nice sense of cohesion with what has come before, Molly’s timeline is now seen as a scar across time infected by retrogenitor particles, and the culmination of events with a Dalek towering over Paris is a fittingly grandiose symbol of this threat that has been lurking in the background for so long. ‘The Monster of Montmartre’ effortlessly flows from beginning to end, fueled by an intense sense of unbridled enthusiasm that hasn’t always been present in the more sombre and morose tales of the Dark Eyes saga. The story as presented is quite traditional in its setup, but its seamless combination of the utterly bizarre with the completely familiar captures the very spirit of the franchise while bringing out the best in both characterisation and imagery to enhance every moment. This is another fine example of the immense relationship that the Eighth Doctor and Liv have developed and provides a perfect blueprint of how to make the most of each’s wide range of abilities in one story. Most importantly, however, is that the presence of the Daleks and the Dalek Time Controller, in particular, completely enhances the story with their use out of necessity rather than simple spectacle, and Nicholas Briggs gives one of his finest performances to bring this eerie menace to life so vividly. 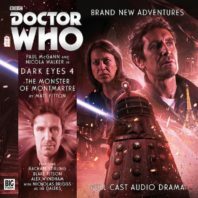 It was difficult to know exactly what direction this fourth and final set of Dark Eyes was going to traverse, but ‘The Monster of Montmartre’ brilliantly sets events in high gear with an evocative and emotional piece that excels on all fronts.